Handmade at cigar maker Jose Blanco's Tabacalera Palma facility in the Dominican Republic and distributed under his Indian Head Cigars company, Rough Rider Sweets premium cigars are blended with Dominican Piloto Cubano and Criollo '98 long fillers bound in Cuban seed leaf and secured by a golden Ecuadorian Connecticut wrapper finished with a touch of sweetness in the cap. Rough Rider Sweets are mild, flavorful, and very smooth with a great natural tobacco taste and notes of honey, wine, and sweetness from the wrapper. 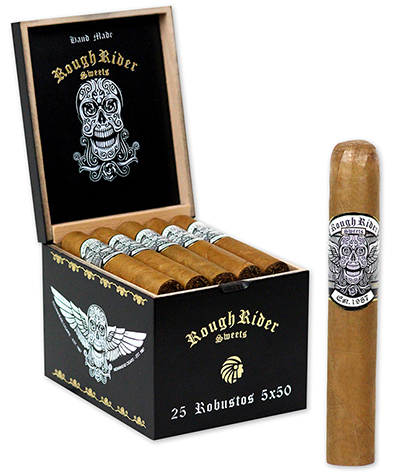 You won't find anything "rough" about these cigars and that includes the price!